In 1925, an Inter-Provincial tournament was held. The selection of the Indian team was to be based on performance in this tournament. Five teams participated in this inaugural nationals - United Provinces, Punjab, Bengal, Rajputana and Central Provinces. 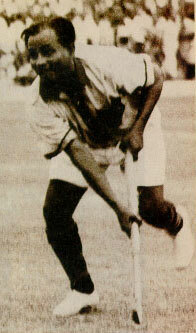 Dhyan Chand got selected for the United Provinces team. Dhyan Chand was playing with civilians for the first time in his life. he Indian Hockey Federation (IHF) was formed in Gwalior in 1925. By then, the International Hockey Federation had also been formed. Both the federations were doing their best to gain Olympic recognition for their sport. After successfully lobbying for hockey to be included in the Olympics, the IHF made preparations to field its best possible team. In 1925, an Inter-Provincial tournament was held. The selection of the Indian team was to be based on the performance of the players in this tournament. Five teams participated in this inaugural nationals - United Provinces (UP), Punjab, Bengal, Rajputana and Central Provinces. Dhyan Chand got selected to play for the United Provinces team. Dhyan Chand was playing with civilians for the first time in his life. Today it seems odd that it took him so long to play against civilians, but that was the way hockey was organised and played in those days. Dhyan Chand practised with his new team members and keyed himself up for the big matches. In the first game against Punjab, on February 14, Dhyan Chand's team drew its match 3-3. This was his first civilian match. Dhyan Chand shone in this match with his passes and dribbling. After being down by two goals, Punjab drew in the last minute of the game. When the teams played again, Punjab's defenders kept an anxious eye on Dhyan Chand. It was as if Dhyan Chand was the only forward! His team won 3-1. In the final against Rajputana, Dhyan Chand revealed his class. Dhyan Chand scored one goal with a powerful hit that went into the net after touching a defender's stick. He also scored the next goal. His stickwork, combination with other forwards, and ability to break into rival defenses was a prime factor in UP's victory in the inaugural nationals. After the tournament ended, there was a meeting between the players and the IHF to discuss the event. Dhyan Chand felt that it was a good idea because it would reduce the communication gap between players and officials, like there exists one in Indian hockey today.